bClinic for Diagnostic and Interventional Radiology (C.M.S. ), University Hospital Heidelberg, Heidelberg, GermanycClinic for Diagnostic and Interventional Radiology (C.M.S. ), Klinikum Stuttgart, Stuttgart, Germany. BACKGROUND AND PURPOSE: Embolization plays a key role in the treatment of arteriovenous malformations. The aim of this study was to evaluate an established (Onyx) and a novel (precipitating hydrophobic injectable liquid [PHIL]) liquid embolic agent in an in vitro AVM model. MATERIALS AND METHODS: An AVM model was integrated into a circuit system. 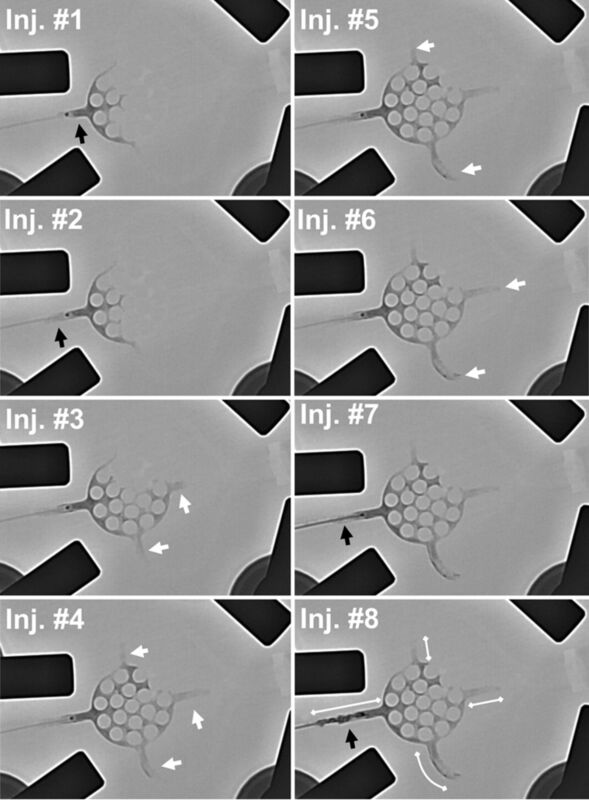 The artificial nidus (subdivided into 28 honeycomb-like sections) was embolized with Onyx 18 (group Onyx; n = 8) or PHIL 25 (group PHIL; n = 8) with different pause times between the injections (30 and 60 seconds, n = 4 per study group) by using a 1.3F microcatheter. Procedure times, number of injections, embolization success (defined as the number of filled sections of the artificial nidus), volume of embolic agent, and frequency and extent of reflux and draining vein embolization were assessed. RESULTS: Embolization success was comparable between Onyx and PHIL. Shorter pause times resulted in a significantly higher embolization success for PHIL (median embolization score, 28 versus 18; P = .011). Compared with Onyx, lower volumes of PHIL were required for the same extent of embolization (median volume per section of the artificial nidus, 15.5 versus 3.6 μL; P < .001). CONCLUSIONS: While the embolization success was comparable for Onyx and PHIL, pause time had a considerable effect on the embolization success in an in vitro AVM model. Compared with Onyx, lower volumes of PHIL were required for the same extent of embolization. A wide variety of embolic agents has been and is currently used for embolization of AVMs. At present, the liquid embolic agents (LEAs) ethylene-vinyl alcohol copolymer (EVOH) and n-butyl cyanoacrylate are used most frequently.4 Although the embolization results have improved since the introduction of EVOH-based LEAs with rates of complete obliteration ranging from 16% to 100%, the success rate of AVM embolization, especially for complex AVMs, is not yet satisfying.2,3 Currently, new LEAs are being introduced to improve embolization features, such as embolization efficacy, intraprocedural handling, and control. Furthermore, their use should improve fluoroscopic visibility and reduce artifacts in postinterventional imaging. The aim of this study was to evaluate an established EVOH-based embolic agent and a novel copolymer-based embolic agent in an in vitro AVM model. Onyx (Covidien, Irvine, California) is composed of nonadhesive EVOH dissolved in dimethyl-sulfoxide (DMSO) in a mixture with tantalum powder, the latter causing radiopacity. To ensure proper mixing of the tantalum powder, we keep Onyx vials on a shaker (Vortex Genie 2; Scientific Industries, Bohemia, New York) for at least 20 minutes before injection. Three concentrations of Onyx are available: Onyx 18, 20, and 34 (increasing in viscosity; numbers indicating viscosity in centipoise). Precipitating hydrophobic injectable liquid (PHIL; MicroVention, Tustin, California) is composed of a nonadhesive copolymer (polylactide-co-glycolide and polyhydroxyethylmethacrylate) dissolved in DMSO with an iodine component (triiodophenol) covalently bound to the copolymer, causing radiopacity. PHIL is ready to use in prefilled syringes of 1 mL and does not require shaking before injection. 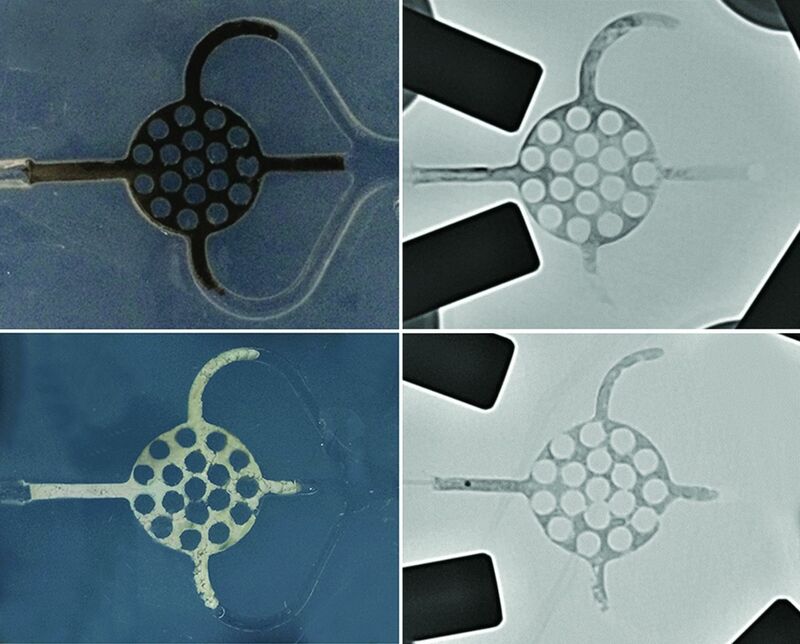 Three concentrations of PHIL are available: PHIL 25, 30, and 35 (increasing in viscosity, numbers indicating concentration in weight/weight). The in vitro AVM model and the experimental setting are illustrated in Fig 1. The AVM model, made of silicone, consisted of an afferent tube, representing the feeding artery, supplying the artificial nidus; a round, flat, honeycomb-like 3D space; and 3 efferent tubes, representing 3 draining veins. It was placed between 2 congruent glass plates, attached with 4 screw clamps, ensuring complete tightness of the model. The diameter of the feeding artery and the draining veins was 2 mm; the artificial nidus measured 15 × 15 × 3 mm with a volume of 311 mm3. The artificial nidus was subdivided into 28 honeycomb-like sections (Fig 2). The AVM model was integrated into a circuit system with a constant flow of sterile 0.9% (weight/volume) sodium chloride solution with a temperature between 20°C and 25°C and a volume flow of 120 mL/minute. Using 3-way stopcocks, we measured endoluminal pressures proximal und distal to the nonembolized artificial nidus 10 times. Proximal to the AVM model, a hemostatic Y-adapter was installed for access. Illustration of the experimental setup. Note that sodium chloride solution (NaCl) was pumped into the circuit system with a constant-flow pump (arrows indicating the direction of flow). A microcatheter was inserted via a hemostatic Y-adapter. Using 3-way stopcocks, we measured intraluminal pressures (manometer symbols). Definition of the embolization success. Note that after we filled the nonembolized AVM model with pure contrast agent, the artificial nidus was subdivided into 28 honeycomb-like sections. A DMSO-compatible 1.3F microcatheter (Headway Duo; MicroVention) was inserted into the circuit system via the Y-adapter. The catheter tip was positioned 3 mm proximal to the artificial nidus. After flushing the catheter with 1 mL of DMSO, we performed manual embolization with 1-mL DMSO-compatible syringes. Embolization was performed under fluoroscopic guidance (Artis Q biplane system; Siemens, Erlangen, Germany) until reflux, draining vein embolization, or complete embolization of the artificial nidus occurred. In case of reflux or draining vein embolization, embolization was stopped and paused for 30 or 60 seconds (see “Study Groups”). Reflux of 10 mm into the feeding artery and embolization of the proximal 15 mm of the draining veins were tolerated. In case of reflux of >10 mm or draining vein embolization of >15 mm, the embolization procedure was terminated. In total, 16 embolization procedures were performed. For 8 procedures, Onyx 18 (group Onyx) and for 8 procedures PHIL 25 (group PHIL) were used as the LEA. Pause time between the injections was set to 30 or 60 seconds (n = 4 per study group). Accordingly, we defined 4 subgroups: group Onyx_30s (n = 4), group Onyx_60s (n = 4), group PHIL_30s (n = 4), and group PHIL_60s (n = 4). The intention of each embolization procedure was complete filling of the artificial nidus. According to the 28 honeycomb-like sections of the artificial nidus (Fig 2), we graded embolization success from 0/28 sections (no embolization of the artificial nidus) to 28/28 sections (complete embolization of the artificial nidus). The number of filled sections of the artificial nidus at the time of the first reflux or draining vein embolization (first pause) was determined. Total procedural time, injection time (defined as the duration of all injections per procedure without pause time), time per injection (defined as the time of a single injection until reflux, draining vein embolization, or complete filling of the artificial nidus), and number of injections per procedure were documented. The volume of the LEA per procedure (less the dead space of the microcatheter of 0.35 mL) was assessed, and the volume of the LEA, required for filling 1 section of the artificial nidus, was calculated (less the dead space of the microcatheter and the volume of LEA in the feeding artery and the draining veins). The respective number of reflux events and draining vein embolization events was documented. For each embolization procedure, the extent of reflux and of draining vein embolization was assessed by measuring the embolized distance of the respective structure (Fig 3). Exemplary embolization procedure. Note the exemplary embolization procedure shown for group Onyx_60s. Eight injections were performed. For 4 injections, embolization of draining veins (white arrows) and, for 4 injections, reflux (black arrows) were the reasons for injection stop. After the eighth injection, the reflux distance exceeded 1.5 cm and the procedure was terminated. After termination, reflux distance and distance of the embolized draining veins were measured (white double arrows injection [Inj.] No. 8) and the filled sections of the artificial nidus were assessed (according to Fig 2). GraphPad Prism software (Version 6.00; GraphPad Software, San Diego, California) was used for data analysis. Quantitative data are presented as medians (range [minimum value; maximum value]). To evaluate statistical differences between group Onyx and group PHIL, we performed the Mann-Whitney U test. To evaluate statistical differences among the subgroups, we performed the Kruskal-Wallis test with a post hoc Dunn test. A P value of < .05 was significant. All embolization procedures could be performed as planned. No technical failure, such as catheter occlusion or catheter entrapment, was observed. Endoluminal pressure proximal to the artificial nidus was 70 mm Hg (70 mm Hg, 70 mm Hg), and distal to the artificial nidus, it was 13 mm Hg (13 mm Hg, 13 mm Hg), resulting in a median pressure gradient of 57 mm Hg. Both embolic agents were sufficiently visible under fluoroscopy. A representative embolization procedure is shown in Fig 3. Representative photographs after embolization with fluoroscopic correlation are shown in Fig 4. Results are presented in Tables 1 and 2 and illustrated in Fig 5. Photographs of Onyx and PHIL after embolization with fluoroscopic correlation. Upper rows, Example from group Onyx_30s. Note the black appearance of the Onyx cast. Lower rows, Example from group PHIL_30s. Note the white appearance of the PHIL cast. A, Volume of the LEA per procedure (left) and volume of the LEA per honeycomb-like section of the artificial nidus (right). For the same extent of embolization, significantly lower volumes of PHIL were required. B, Filled honeycomb-like sections of the artificial nidus. Embolization success was comparable between group Onyx and group PHIL. A pause time of 60 seconds resulted in a considerable, however not statistically significantly, higher embolization success for Onyx. A pause time of 30 seconds resulted in a significantly higher embolization success for PHIL. Onyx indicates Onyx 18; PHIL indicates PHIL 25. When we compared group Onyx and group PHIL, the median amount of LEA per embolization procedure was significantly higher for group Onyx (0.48 mL versus 0.15 mL, P = .002). This finding was even more distinct for the median amount of LEA per filled section of the artificial nidus (15.5 versus 3.6 μL, P < .001). The median number of filled sections of the artificial nidus at the time of the first reflux or draining vein embolization was significantly higher for group Onyx (13 versus 9, P = .032). However, the median number of filled sections of the artificial nidus (embolization success) did not show significant differences between group Onyx and group PHIL (24 versus 20, P = .780). Also, total procedural time, injection time, time per injection, number of injections, and the frequency and the extent of reflux and draining vein embolization did not differ. When we compared group Onyx_30s and group Onyx_60s, subgroup analysis revealed a trend toward a higher median number of filled sections of the artificial nidus for group Onyx_60s, however, without reaching statistical significance (27 versus 21, P = .169). The median injection time was considerably higher for group Onyx_30s (34 versus 14 seconds, P = .270), also without a statistically significant difference. When we compared group PHIL_30s and group PHIL_60s, subgroup analysis revealed a significantly higher median number of filled sections of the artificial nidus for group PHIL_30s (28 versus 18, P = .011). In this experimental study, the established LEA Onyx and the novel LEA PHIL were evaluated and compared in an in vitro AVM model. As a major finding of this study, the embolization success was comparable for Onyx and PHIL. However, pause time between injections had a considerable influence on the embolization success. For the same extent of embolization, lower volumes of PHIL compared with Onyx were required. We could demonstrate that compared with Onyx, lower volumes of PHIL are required for the same extent of embolization. In quantitative terms (calculated by using the medians), 0.23 mL of PHIL had the same embolization effect as 1.00 mL of Onyx. This aspect has to be considered when using PHIL in clinical practice. As initially indicated, the aim of AVM embolization is complete filling of the nidus. Unwanted reflux into the feeding arteries should be minimized because it can cause embolization of nontarget arteries or close the access way before complete filling.8 For Onyx and also according to the preliminary experiences for PHIL, a certain degree of reflux is intended because it causes plug formation around the catheter tip, which enables and improves antegrade movement of the LEA and deep penetration of the nidus while simultaneously reducing the risk of reflux after successful plug formation.10⇓–12 Regarding the frequency or extent of reflux, no significant differences between Onyx and PHIL were observed. The required time for plug formation was short for both LEAs in our experimental setup. Premature embolization of the draining veins should be avoided because an increase of intranidal pressure can occur, resulting in intra- or postinterventional hemorrhage.2,3,9 PHIL is thought to have a column effect, decreasing forward flow into the venous side of an AVM, diminishing venous obliteration, which may reduce the rate of hemorrhage due to venous outflow obstruction.10 However, in our study, the frequency and extent of forward flow into the draining veins of the AVM model was comparable for Onyx and PHIL. The significantly higher number of filled sections of the artificial nidus at the time of the first reflux or draining vein embolization for group Onyx can be interpreted as a sign of higher intranidal forward flow compared with PHIL. However, the primary end point—final filling of the artificial nidus—did not show significant differences. There were some limitations to our study. First, the number of trials was small. Second, transferability of an in vitro model to clinical practice is limited. Third, there might be more or other optimal pause times besides the ones used in this study. Fourth, there was constant and not pulsatile flow in the circuit model. Onyx and PHIL showed comparable embolization success in an in vitro AVM model. Pause time between injections had considerable influence on the embolization success. Shorter pause times (30 seconds) resulted in a significantly higher embolization success for PHIL. Compared with Onyx, lower volumes of PHIL were required for the same extent of embolization. Disclosures: Dominik F. Vollherbst—OTHER: This study was technically supported by MicroVention and Medtronic. Christian Ulfert—UNRELATED: Travel/Accommodations/Meeting Expenses Unrelated to Activities Listed: MicroVention; OTHER: The study was technically supported by Medtronic and MicroVention. Johannes Pfaff—UNRELATED: Payment for Lectures Including Service on Speakers Bureaus: Siemens; Travel/Accommodations/Meeting Expenses Unrelated to Activities Listed: Stryker. Martin Bendszus—UNRELATED: Board Membership: Data and Safety Monitoring Board for Vascular Dynamics; Consultancy: Codman Neurovascular, Roche, Guerbet, Boehringer Ingelheim; Grants/Grants Pending: Deutsche Forschungsgemeinschaft, Hopp Foundation, Novartis, Siemens, Guerbet, Stryker, Covidien*; Payment for Lectures Including Service on Speakers Bureaus: Novartis, Roche, Guerbet, Teva Pharmaceutical Industries, Bayer AG, Codman Neurovascular. Markus A. Möhlenbruch—RELATED: Provision of Writing Assistance, Medicines, Equipment, or Administrative Support: This study was supported by MicroVention and Medtronic with embolic materials and microcatheters; UNRELATED: Payment for Lectures Including Service on Speakers Bureaus: Codman Neurovascular, MicroVention, Medtronic, phenox. *Money paid to the institution. This study was technically supported by MicroVention and Medtronic. The authors had full control of the data and its analysis throughout the study. Accepted after revision February 23, 2017.